A Chin Na expert must also know how to escape from an opponent's Chin Na control, and be able to counterattack and reverse the situation. To escape from an opponent's control, you must master several techniques in addition to those explained in the previous section. The main reason for rotation when you are grabbed is to change the angle of the grab. When your opponent grabs you, he will try to do it at the most effective angle and location. In order to escape you must act immediately. If you cannot rotate and change the situation before he has completed his control, you have lost. It is therefore extremely important to thoroughly practice escapes both by yourself and with a partner. When you neutralize an opponent's grabbing attack, it is important to remember to neutralize it in such a way that he cannot immediately continue his attack with another technique. Usually, when you rotate out of a grab, you will pull your hand back as soon as possible, but while you do so you must prepare to deal with a possible punch if your opponent tries to continue his attack. Solo escape practice is very simple, and you may use almost all of the escape techniques. You simply use one hand to apply the technique to the other hand, and practice the escape with the grabbed hand. Solo practice has the limitation that, since you know and expect the technique, you cannot build up much sensitivity. It is therefore necessary to also practice with a partner. Pressure release escape is the natural reaction of your body to pain. The principle is very simple. When your opponent tries to control you with Chin Na, before he completes his control, you simply use your other hand to grab the opponent's fingers or hand that is causing you the pain. This pressure release technique is commonly used in Chin Na counterattack. In this case, right after you have released the pressure, immediately change your grab into a Chin Na technique. Therefore, pressure release escape can be practiced only with a partner. Distraction escape is probably the easiest and most effective technique among the three. Before your opponent has completed his control, you simply distract his concentration, for example by kicking his shin or groin. Alternatively, you can use the other hand to punch his nose or poke his eyes. When his attention is unfocused, you immediately escape from his grab and, if possible, counterattack with a Chin Na of your own. Distraction is commonly used both in offense and defense. In offense, you will often find that your opponent tenses his muscles right after you grab him. This makes it very hard for you to continue your technique. When this happens, simply punch or kick him to distract him, and immediately apply a Chin Na. Remember that Chin Na is effective only when it is a surprise. It would be very hard to say which technique is the most effective escape, because it depends on the situation and the technique being used. It is impossible to discuss escapes for every situation. However, once you understand the principles and have practiced a lot with your partners, you will soon find that escaping is much easier than controlling. Once you thoroughly understand a Chin Na technique, you should already understand the escape. Always consider escape first and counter second. You must save yourself first before you can counterattack. It cannot be denied that sometimes a counterattack is the best way to escape. However, you should train yourself to escape first, and once you have developed your reactions enough you will find yourself counterattacking naturally when it is appropriate. If you are not sure you can use a grabbing Chin Na for your counterattack, do not use it. Punching or kicking counterattacks are much easier, faster, and safer than grabbing Chin Na. When you use a counterattack, you must react before you are completely controlled. You should understand that a perfect grabbing Chin Na control is very fast and effective when done by a Chin Na expert. Once you are controlled completely, you will not have any chance to escape. The crucial key of a successful counterattack is following the opponent's motion and then changing the angle. If you resist at the beginning, you will have set yourself up for your opponent's locking. However, if you follow his motion, it will become difficult for him to lock you in the angle he desires. This will also provide you an opportunity to change the angle of his locking and lead him into your trap for your counterattack. Since there are many possible counter techniques to use against each grabbing Chin Na, it is impossible to describe all of them. With your own diligent training, it is quite possible that you will find a counter for a particular technique which is more effective for you than the ones described in my Chin Na classes, books and DVDs. 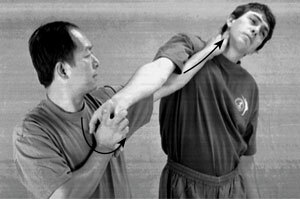 You should realize that usually it is much harder to apply most of the grabbing Chin Na techniques to an opponent than it is to just punch him or use a cavity strike Chin Na. However, cavity striking requires a more thorough knowledge of acupuncture points and understanding of which cavities are vital at which time of the day. To use a grabbing Chin Na on your opponent effectively will show him that your fighting ability is much greater than his. Therefore, if you are not confident that you can handle your opponent, you should not take a risk and use grabbing Chin Na. Remember: to show mercy to your opponent means to be cruel to yourself. When you are in a fight, you should immediately seize your opponent's will, confidence, and fighting spirit. This is spiritual Chin Na. This means that at the beginning of a fight you should use your spirit and confidence to discourage your opponent and make him lose his fighting confidence and spirit. Usually, this spirit and confidence is shown on your face and in the way you look at him. From your eyes and face, your opponent can sense your spirit of vitality, your courage, your confidence, your calmness, and subconsciously, even your Qi capacity and will power. If you can conquer your opponent with this first visual and mental contact, then you have reached the highest level of Chin Na -- to seize the opponent's fighting spirit. Remember: the highest fighting art is to fight without fighting. However, if you are not able to discourage him and you must fight, then you must know a few things. Is your fighting ability greater than his? Will you be able to use grabbing Chin Na to stop the fight? In order to use a grabbing Chin Na successfully, you must first test your opponent and see how his reactions are. This test will reveal his style, and will let you know whether a grabbing Chin Na will work. Remember: fight smart and safe, not brave and stupid. In order for your grabbing Chin Na to be effective, your techniques must first of all be fast, natural, and skillful. In a fight, everything happens so fast that you do not have time to think, so your reactions must be natural. You must therefore train so that your reactions are flexible, and you can react quickly and correctly to changing situations. Not only that, you must also know how to fool your opponent and set him up in a position favorable to your Chin Na application. All of these things must be trained constantly until they are part of your natural reaction -- only then will you be able to use grabbing Chin Na effectively in a fight. In addition to the above, there are a number of things you need to train before you can effectively use grabbing Chin Na in a fight. Since you opponent will not cooperate with you, it will be quite different from practicing with a partner. You need to know the ways of setting your opponent up for your Chin Na control, including an effective intercept of his initial attack. If you just learn the techniques by rote, and never learn to develop yourself through your own research, then you should not be called a master of Chin Na. A master must know how to keep the old and develop the new, while always following the correct principles and rules. With more than five thousand years of research and training behind them, the Chinese martial arts cover a very broad range of techniques, using the hands, legs, and numerous weapons. The higher levels of Chin Na, which require the development of Qi and Jin, must be felt, and usually they can only be learned through oral instruction from a qualified teacher. If you wish to reach the highest level of skill, but cannot find an instructor, then you must read, attend seminars, ponder, and practice. If you persevere, after several years of training you may find yourself at the doorway to the higher, internal side of the art.